Several years ago as I did my Oregon-California roadtrip, I had the chance to spend Thanksgiving day learning a bit about growing olives. I have previously shared some of the things I learned in my A to Z in agriculture as o was for olives! But with this series I wanted to mention my friend Jamie Johannson and his farm Lodestar which I visited on that same trip. 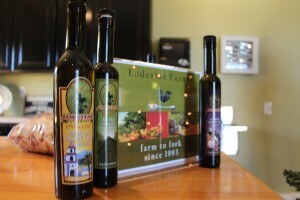 Jamie and his family have a history growing olives in the town of Oroville, California. In the last few years, they have been doing more direct to consumer and I have to say it was the first time I had someone help me understand the differences in tastes based on old crop and new, the first press, etc. I highly recommend you check them out online and in person! We set ourselves apart from many farms these days by still being an independent pork producer. This means the farm owns all of their pigs, in a time where a lot of the industry has vertically integrated. We also work hard as conservationists, using no-till on 100% of our acres, and cover crops to protect our soil and water quality. 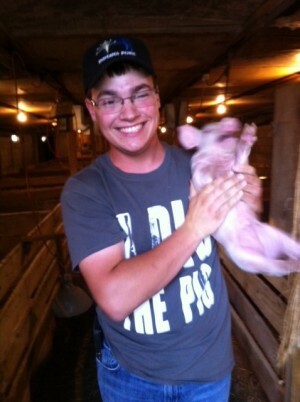 I was a ten year 4-H member, and grew up in a rural area of Southern Indiana, so that got me curious about agriculture. 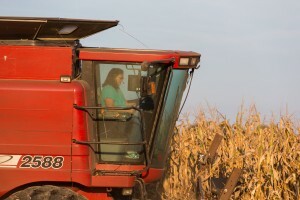 In high school, my then-girlfriend (now fiancee)’s dad offered me a job on their farm since I had an interest in production agriculture. This was what you could call my “foot in the door,” and they haven’t gotten me to leave the farm since! I then got involved in many agriculture organizations, advocate for policy, and have gotten the chance to do some traveling as well. For me, the best part of farming is getting to experience the miracle of life in our farrowing barns every other month. Getting to watch as our daily efforts help to grow happy, healthy pigs, that will go out and help feed the world is one of the best feelings you can have. Tell us about one of the people who has helped you most in your career. The single most helpful person at this point in my career has got to be my fiancee’s father, and my first employer. He hired me as a high school student, and helped me realize where I want to spend my future. He’s been a mentor to me over the last five years, and I can not say enough how beneficial it has been. Thanks for the opportunity to share my passion about LeCows Dairy and the importance of growing up on a family dairy farm. As a fifth generation dairy farmer, this is the only lifestyle I have ever known. My love of farming began at an early age and now is stronger because of my grandchildren who will be the seventh generation to continue this legacy if they wish. I started carrying a camera in my pocket about ten years ago. Taking photos was a way to document what happened each day on the farm. Life is never dull or the same on a dairy farm. I started my Facebook account in 2008 and added a few photos. As the pictures with captions began to increase my followers and interactions followed suit. Then I started writing a “blog” to accompany the album of photos posted. The feedback was encouraging and people seemed to be able to relate our stories to their experiences. There was an underly theme to my posts, and with the arrival of Sadie our first granddaughter I knew what it was. I had grown up dairy happy on the farm, and we are now watching Sadie, Grant and Audrey “growing up dairy happy”. Now we share our daily family farm life on many different social media venues. From Sadie’s first trip to the barn or sitting in a car seat as we deliver a calf. When you grow up on a farm, you start learning life lessons early. I did not realize the blessings of a farm education at the moment of growing up, but now I appreciate the opportunity I had to grow up and learn on the farm. My daughter, Ellie Gore Waggoner and I have almost always worked on the dairy farm. Although we followed two different paths, I could not wait to return to the farm and she couldn’t wait to leave the farm. After a few years of being in the “real” world, she decided that the farm was the best place to be. My Dad had worked with his parents, grandparents, and uncles. But Dad and Mom had a dream to have their own family farm. He moved us a few miles down the road away from his family, and this has been home for fifty years. The farm had been called the Louis Elliott Family Farm for most of those years. In 2007, we had a change in management and I was now the farm manager. With that change, Dad wanted Ellie and me to pick a new name and after much thought LeCows was born. We own 900 acres and rent some ground. We grow 400 acres of corn, 400 acres of soybeans, and 100 acres oats, 200 acres of wheat and roughly 100 acres of hay. We sell some of our, but much of it is saved to feed our dairy herd. We milk between 100 -110 Holstein cows and we raise our calves. The heifers will grow up to be replacement heifers, and the bulls are raised for beef. Our farm is owned and operated by women and our husbands are city guys. I never really knew that I was doing a “man’s job” because this was I grew up doing. The same with Ellie as she grew up on the farm. What ever needed to be done, we did. From taking care of the cows and calves, to planting and harvesting the crops, we are farmers who happen to be ladies. My Dad always encouraged me to do what I wanted to do without limitations. Our first granddaughter is two and half and is being exposed to life as farmers. It’s our lifestyle. My paternal grandmother was a dairy farmer who I never met, but she had the same love of farming. Ellie married non-farm guy who is an independent truck driver. He too had never been on a dairy farm, but has become one of most valauable additions. Dustin has a unique gift in his ability to learn fast and master new skills. From equipment operator, mechanic, eletrican to plumber, there is nothing he cannot do, but does it well. He and Dan both love to learn and do it well. They both do research to learn but the difference Dustin can implement what he learns and does it well. Both are family oreinated and activie in taking care of the children and our parnets. We are Blessed to have them join our family as we all grow together. 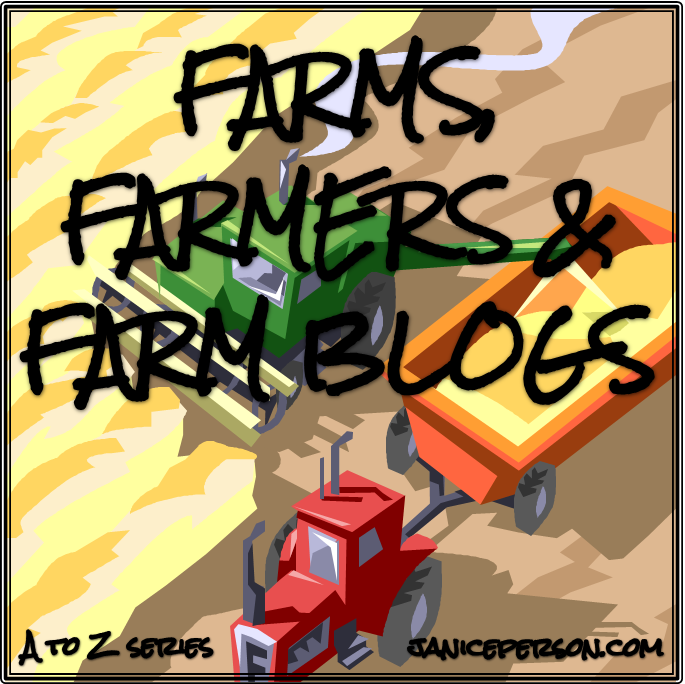 Step-by-step, we are getting to know various Farms, Farmers and Farm Blogs in this A to Z series. Do you have things you’d like to know about these farms? If so, please give a shout in the comments or feel free to go direct to the source too! And don’t forget not only are there other letters coming up, but there is a long list of farm blogs here too!